Nittany Landscape Contracting and Lawn Service, Inc.
Nittany Landscape Contracting and Lawn Service, Inc. was established in 2006 by owner Bill McDowell. While persuing a logistics degree at Robert Morris College, summers were spent working at a local landscape company. After graduation and accepting a position in the transportation field, Bill decided that working outdoors in landscaping was where his true interests were. 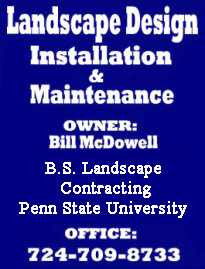 Going back to school at Penn State University, he completed a degree in landscape contracting. With this knowledge and 17 years experience, Nittany Landscape has grown to a full service design/build landscape contracting company. With an experienced staff, Nittany Landscape strives to provide our customers with prompt, professional, and high quality services. Using top of the line materials and shrubs, we ensure your job will last for years to come adding beauty and value to your property. Call to schedule an appointment. Join our list of satisfied customers, making your landscape dreams come true.